I was wandering through the various cyber-highways this evening and came across two items which fascinated me, partially because they are hidden away, and partially because they have a great deal to do with one of our shared interests. The chances are that I would have come across them anyway, regardless of whether I had found your address and noticed your interests, but it just seemed as if the timing was right; added to which I had a very pleasant written conversation with a friend in California about the freedom of the mind: he noted that the body can be imprisoned, but the mind can roam throughout the known and unknown world and never be harnessed. At the same time he was worrying that his mind was being placed before too many obstacles to be capable of thinking freely, and whether he would have the strength to fight these hurdles. The fact that he realises he is not alone, and our conversation is a very good sign of this recognition, makes it that much easier for him to remain free in the mind despite being physically imprisoned. The first item I came across was an old report from Atlanta about a journalist who, aside from his normal work of writing for a newspaper, had decided to exercise his grey particles further by writing a letter to someone every single day of the week for a year. Now, it isn’t clear whether he only writes one letter to a person and then doesn’t follow it up, or whether he replies when they reply to his letters, but the idea is a very appealing one, and it appealed to me as a letter writer, and because I had, in my own small way, attempted something similar. Admittedly I did not set myself such a massive target as he had done, but I did settle down in February and write one letter each day – and a week on either side – to see whether it could be done and how I would manage it. The challenge is not just to write a letter, but to make each one of those letters an individual work, avoiding repetition and trivialities designed just to fill up sheets of paper. That the letters have to be written to strangers is one of the bonuses of the whole idea, since you begin each relationship – one-sided or otherwise – with a completely new slate and can literally write whatever you wish, without the other person questioning you from past knowledge. I can also imagine there are not that many people who could come up with two hundred friends, or so, who they could write to without a great deal of difficulty. I mean, what happens when one friend hears you are following this project, but hasn’t received one of the earliest letters? How will they react? This letter writer was one of the lucky ones, though, since he did receive replies to his missives and, if I understood the report correctly, many more than might have been expected. Because of his name perhaps? Because people knew that he is a journalist and found him interesting as a result? Or perhaps because they thought replying would gain them some brief moment of fame, by association if nothing else? Quite possibly a mixture of all these. I also wasn’t clear how many answers he received but, if I’m going to judge by the number of letters which grace my post box each week, In suspect that somewhere around twenty percent would be a very good ratio. My aim, though, is not merely to fill a quota, not to just write to strangers and say I’ve achieved a certain level after so many weeks, months or years, I don’t think I could do that. I am more interested in writing to people who seem to have some form of similar interest, who might possibly be capable of writing interesting, involved letters back, and who would welcome the (private) attentions of someone interested in nothing more than written communication. This is why the second discovery of the day was of far more interest: a lecture by Wesley Cecil in his Humane Arts lecture series on letter writing. It must have been made in about 2010 – 2012, which makes it fairly recent, and most of the information he gave to his students – it was a live lecture somewhere – is as relevant today as it was then. Although, that said, he spoke more about the history of education than he did about letter writing, trying to explain why letter writing was different today to what it had been several decades, even centuries ago. He covered the simple means of education used in previous centuries, the ones which Marcus Cicero, Wolfgang von Goethe and Isaac Newton lived through, to the one in use today which, he contends, is far less competent at educating the masses in the true arts than wad the far simpler means of yesteryear. One of the interesting facts he brought out – aside from that those I’ve named, who lived centuries apart, received the same style of basic education – is that a man could have worked his way through the entire educational system and be fully qualified for the real world by the age of fifteen, if he took the advanced, longer educational course. If he took the shorter one, he’d possibly be finished by twelve or thirteen years of age. Hard to believe that some of the brightest minds of history went through an educational system which released them, fully qualified, by the time they were fifteen. Today I am surprised if some people can read and write by that age. The secret, he told us, was that the educational system then, which comprised three initial courses and then, for those who wished it, an additional four, was designed to give the foundation for a good education, and all the rest had to be learned by the pupils through work experience and their own means. They were required, in effect, to go out into the world and learn, to do their own research, to advance their own level of knowledge without having it pounded in to them by a bored teacher standing at the front of a class, repeating the same things day-in, day-out, year for year until they retired. The educational system back then required pupils, students to do their own thinking, to allow their mind’s free rein and to explore their world outside of the classroom, something we seem to have lost today. Nowadays we are taught that the curriculum is everything, and we have to stick rigidly to whatever is told us or risk gaining failing marks at the end of our time. In effect, we are taught to move within a very small area of knowledge which is not necessarily correct, certainly not complete, and decidedly limiting. 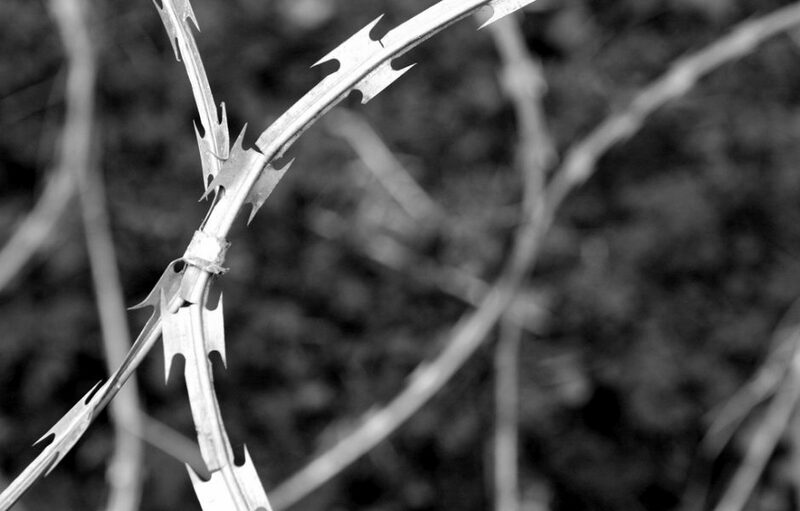 We are behind that razor wire before we even realise that such a thing exists. Although, I must admit, I do not agree with him in some ways. The letter writing section of the lecture on letter writing covered about fifteen minutes out of seventy; plenty of historical background, but little of substance on letter writing itself. And then he spoke on two things which almost made the hair rise on the back of my neck: spelling and the privacy of letters. It is good and proper that people learn grammar and how to spell today, it is expected, even demanded. A good education includes the ability to write without making mistakes, even if that ability is no longer taught as it should be and most people effectively leave school illiterate, at least compared to what was churned out a few decades ago. We all have spellcheckers and anything written on a computer these days has a red line under it where there’s a spelling mistake, a blue one where a word makes no sense in the context of a sentence. Mostly, not always. Even the best computers make mistakes, especially when it comes to the nuances of a very complicated system of communication. The idea, though, that our forefathers had no problems with spelling because they had learned grammar in school jars with me. I know that it is not correct, because spelling wasn’t taught as much as grammar and communication, and because many countries, many English-language countries, did not have a set of spelling rules in place. What Charles Dickens wrote might have been handled with the same words but different letters by his brother Erasmus, or by any one of their friends in educated society. When I read through the journals of the highly educated and highly esteemed Samuel Pepys, I see all these alternate spellings, and know that no one thought ill of them, so long as they could understand what he was writing about, so long as his message came across clearly. And then there is the idea of privacy. When Hermann Melville wrote to Nathaniel Hawthorne he would not necessarily have expected his letters to be read exclusively by him. Many letters were read by the recipient, and then read aloud to guests, even shared, in the old fashioned way, by being sent on to other people or copied and dealt out to all who might have an interest. Wesley Cecil brings forward the idea that letter writing was a very personal and private matter, and that many people involved would simply poor out their hearts in a letter to someone else without any further thoughts of privacy or security. This was simply not the case, unless an author specifically asked that a letter not be shared, or the contents were of such a delicate nature, the recipient would not have given a thought to passing them on to anyone else. Here the razor wire of communication, of the thoughts put down on paper, does not exist either, it is a very modern thing indeed. He also tells us that letter writing died effectively in about 1920. Now, this may well come as a surprise to you, since you have a letter in your hands right now and it is clear that the Art has not completely died out, but he meant it in a different sense: letter writing as a deep and meaningful Art, has died a death. People today tend to write the occasional note of thanks for a Christmas or birthday present, but nothing that takes up more than one side of a small page, and certainly nothing where the recipient would have pause for thought, would have to consider in a deeper manner the words confronting them. The very art of communication had changed beyond all recognition, with mails and texts flying across nations, ignoring borders and controls in their rush to get from one person to another. We have become dependent on computer systems, on networks, on the digital capabilities of small hand-held gadgets rather than our own intelligence and creativity. We have become trapped within the compound of a system which is designed to make life much easier but which, in the process, destroys the freedom we once enjoyed, the freedom of expression and thought. My friend in California writes poems and enjoys the freedom of thought which this appears to allow him. He also mixes well with everyone else, playing basketball and doing all the other things allowed within a very restricted regime. He worries, though, that his thoughts are becoming tainted, that he is losing this last vestige of freedom, and revels, as a result, in the chance to communicate, to allow his thoughts a free run in all possible directions. It is a very hard transition, going from a life which had everything on offer at the touch of a button, to one of thinking over what might have been. But, like you, he does not see the razor wire as being a limitation to his possibilities when it comes to thought and to communication: he, like you, reaches out with his words and takes the words of others back in to himself, works with them, thinks and expands his horizons. He uses the one thing which cannot be held back, his mind. Of course, we are all looking for different things in life; our experiences are not the same and we have individualities which are sometimes impossible to reconcile with those of others. Then, sometimes we have hopes and dreams which can never be realised on our own, but only through the good offices of someone else. Some of us accept this and make the best we can of our lives, whether it be behind the physical razor wire or through a disability of some form or another which makes physical activity impossible, or limits it so much that it is as good as impossible. Most of us look for some way to get around what is happening, or what has happened to us; we look for a way out which is not exactly an escape, but the next best thing to it. We look for friendship, companionship, communication and, above all, a means of overcoming, of mounting and surmounting all the obstacles, and of winning. After all, as you say, freedom is only a state of mind, but it is one which is there for the tasking, if we bother ourselves.